Sponsors, patrons and marketing. Back in ancient times, as today, publishing was expensive and a writer sometimes needed deep pockets to get a book printed and distributed. Some had wealthy friends and with the promise of a full page preface of grovelling praise and adulation a deal could be done on financing the work. If this failed there was a Plan B - to sell off an appearance on a specific map. If there was to be 30 or 40 maps to a work the financial burden could be spread accordingly, and each sponsor would only be required to contribute a small proportion of the total cost. The patron, proud of the mention in such a modern publication, would show the work to all friends and visitors, thus propogating an advertising campaign. 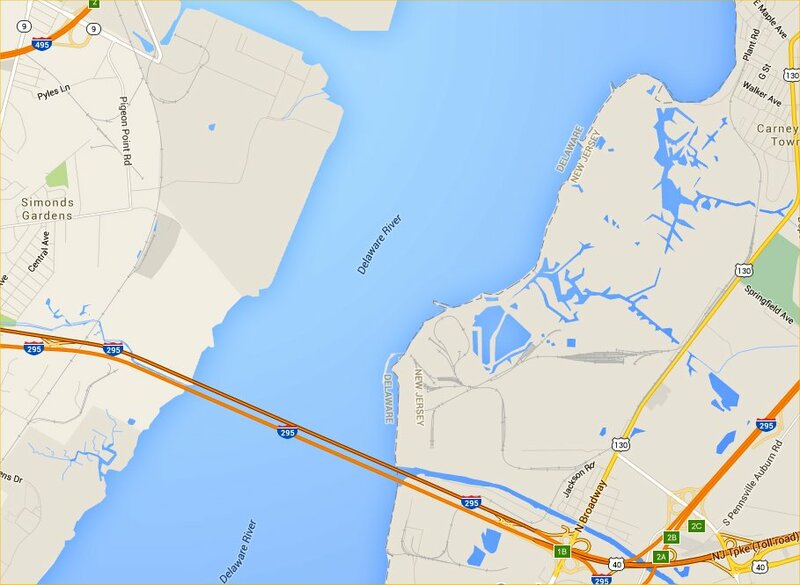 Mile markers on maps. This is the tale of a situation that has resulted in a lot of confusion when investigating the history of a village in Kent. 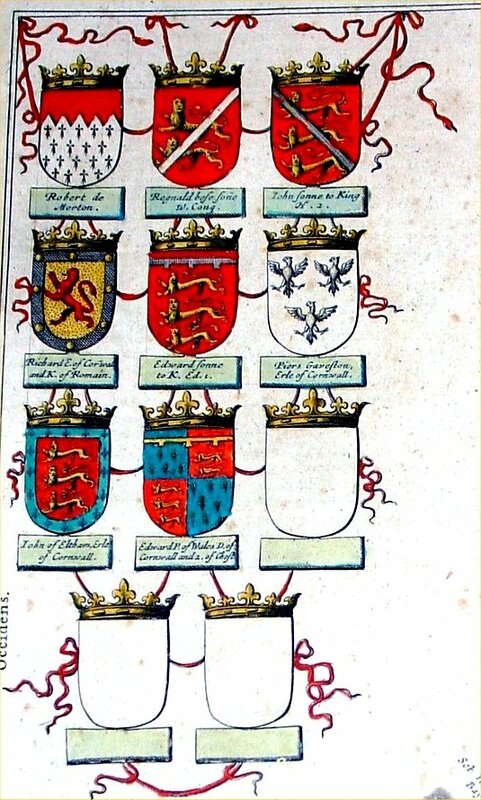 John Ogilby's set of road maps produced in 1675 showed mile markers along each road. Our target village, Pembury, was shown on the London to Rye map, and this was copied for over 100 years as a valuable aid in the days of coaching. 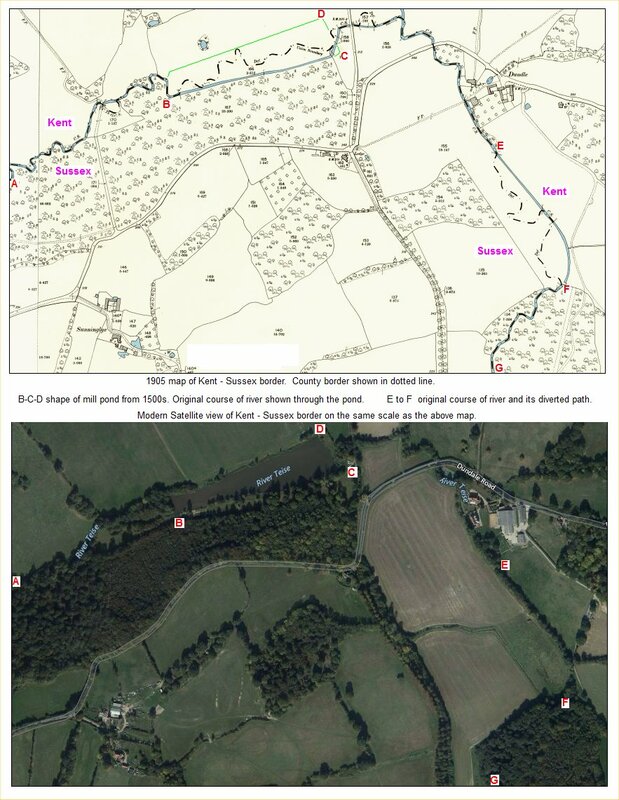 Comparing the locations of the 1675 Ogilby mile markers with the modern OS maps, and further with the actual location of milestones on the ground, highlighted a half mile error on all locations. 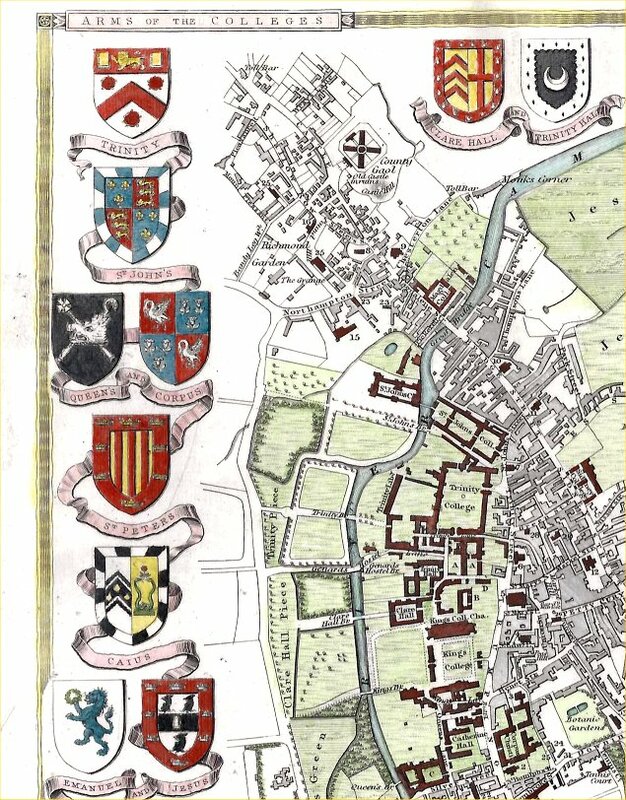 The full, gory details are explained via the link below, but the outcome was: Ogilby's surveys started their measurements from Cornhill in London, and they were just spots on maps - there were no milestones. 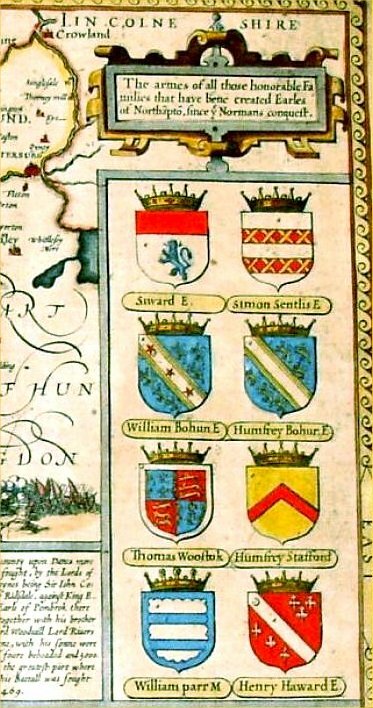 Some years later when all major roads were compelled to have milestones the new survey claimed its origin, for the London to Rye map, as the south side of London Bridge - half a mile short of Cornhill. 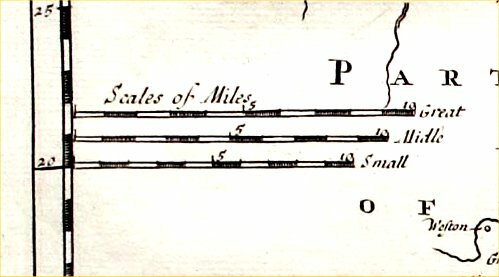 Ogilby's maps did adopt the 'standard' mile of 1760 yards from the wide variety of miles on offer at the time. Scale and accuracy. 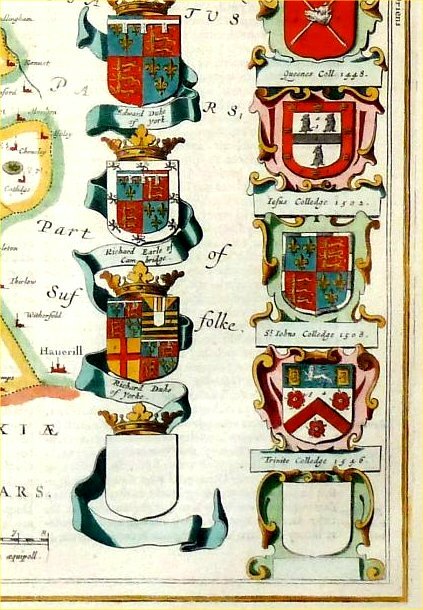 This was never a strong feature on old maps. 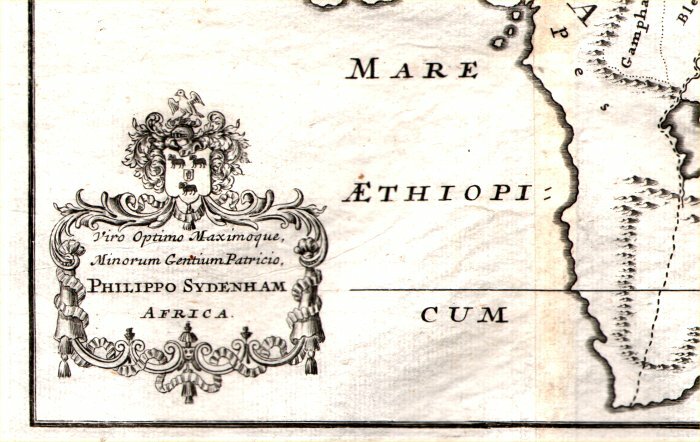 It's easy to give them the benefit of the doubt with crude survey techniques, but to give different interpretations of the same features in the same atlas is sloppy workmanship. Speed, Blaeu, Jansson and a whole bunch of others are guilt of this practice. 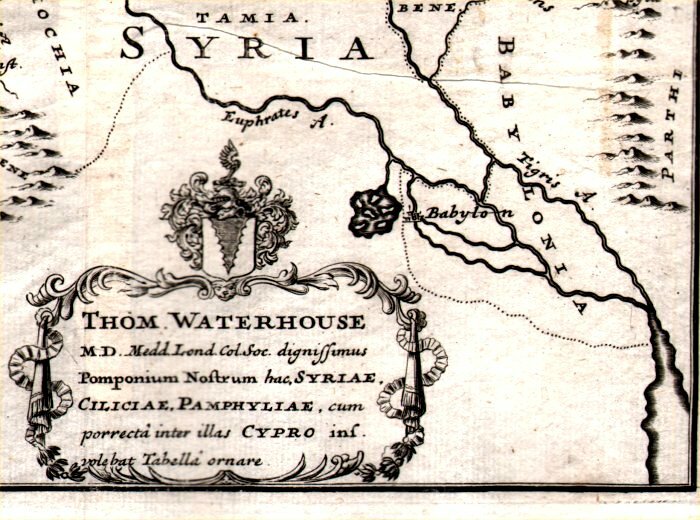 A typical instance is the River Thames running eastward from London toward the North Sea. 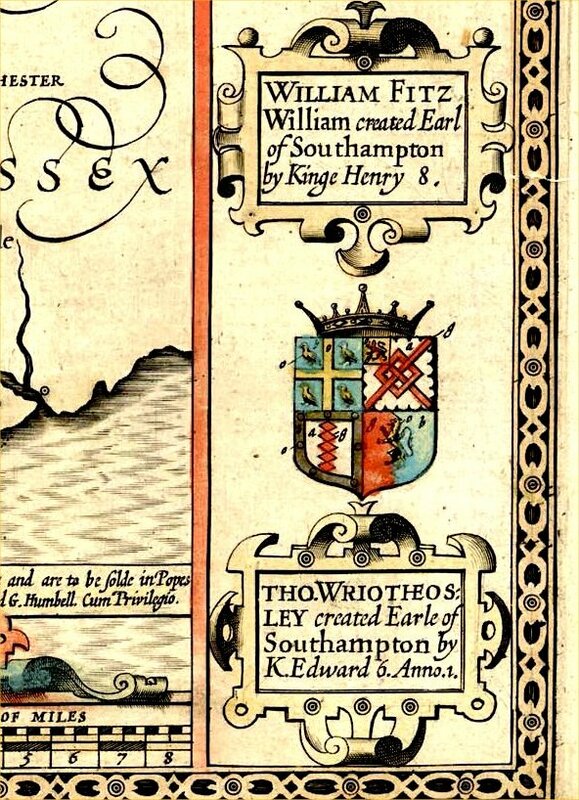 Essex is to the north and Kent is to the south, so it is reasonable to expect the shape of the river to be the same on the Essex and Kent maps. Well, it isn't. 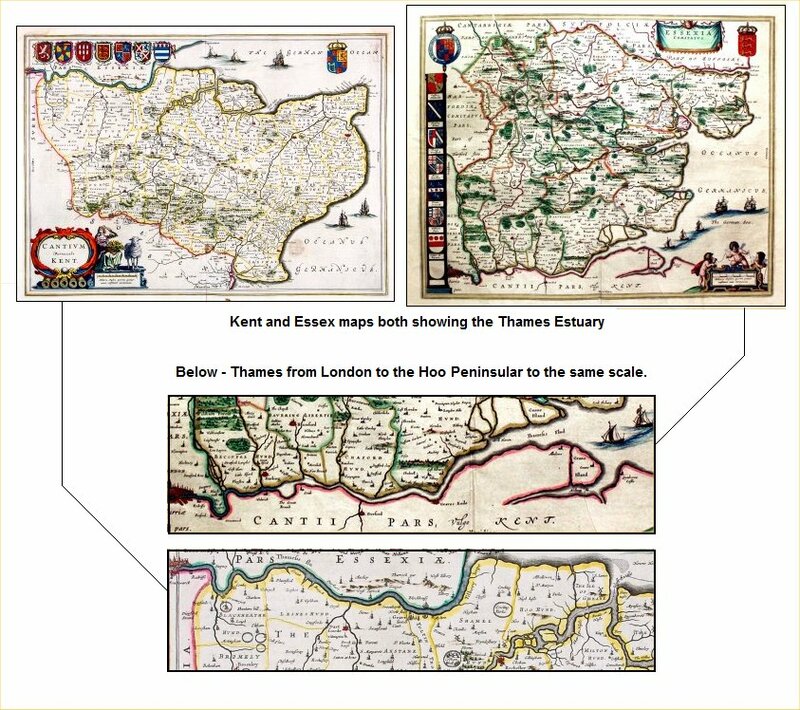 When these maps are hanging on a wall, side by side, the comparisons become noticeable and the mind begins to ponder if the Kent/Sussex border is similar on those two maps or how Norfolk aligns with Suffolk. The Thames from London to the Hoo Peninsular. Sea monsters, devils and dragons. A fun part of investigating old maps - particularly for newcomers and the young. 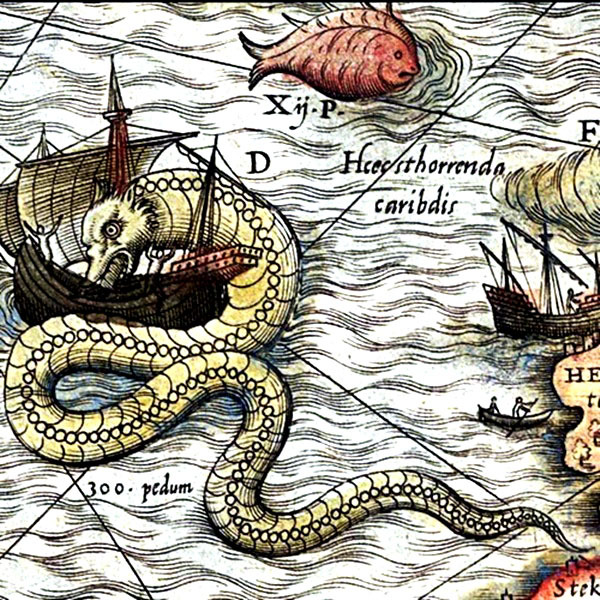 There were no claims of 'here be dragons' or 'here be sea monsters' - that's the stuff of fantasy comics and fiction novels. These were just visual embellishments to fill the blank space occupied by sea and ocean. As with ancient maps of Africa and Asia when there was no data to fill empty voids they made it up - inventing mountains and rivers to avoid the displeasure of empty space. The sea area was populated with cartouches, scales and tables and when there was still space to fill they introduced sailing ships and sea creatures. It's generally far off lands that attract these monsters, inferring a danger and excitement of undiscovered shores. 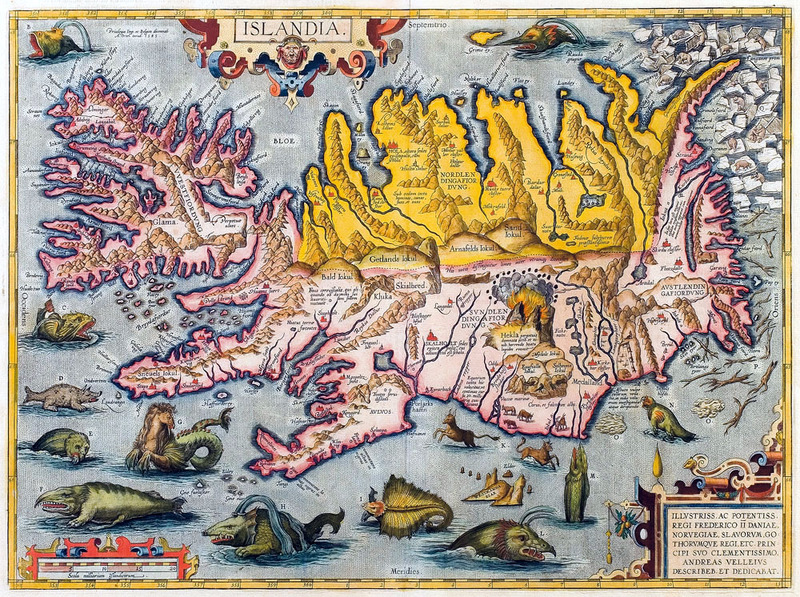 For some reason maps of Iceland attract lots of sea monsters. Borders and Boundaries. In ancient times many counties, states and administrative regions were limited at geographic features - rivers, mountain ranges, lakes, etc. It was easy to determine and easy to police - you stay that side and I'll stay this side. There are many cases of the geographic feature moving and the maps reflecting the original boundary. In our test case, linked below, we have the boundary between Kent and Sussex in the south east of England. For several miles the boundary is determined by the course of the River Tease with Kent to the north and Sussex to the south. At one point the boundary is seen to wander through the middle of a pond and at another point the river is seen to have a diversion from the boundary. In the 1500s there were lots of small iron forges and furnaces in this part of the world, mostly supplying iron for cannons and guns. The river was damned to create a pond for the iron works, and the pond still exists today. 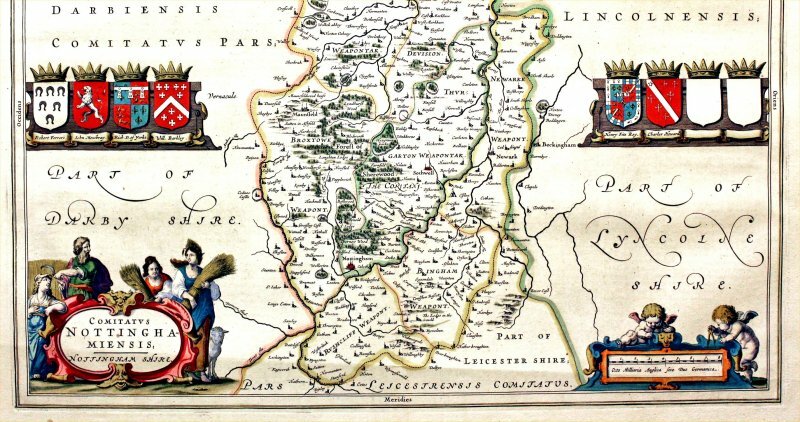 The original course of the river can be seen by the county border wiggling through the pond. The other feature to the east of the mill pond is the deliberate straightening of the river away from its original county line. 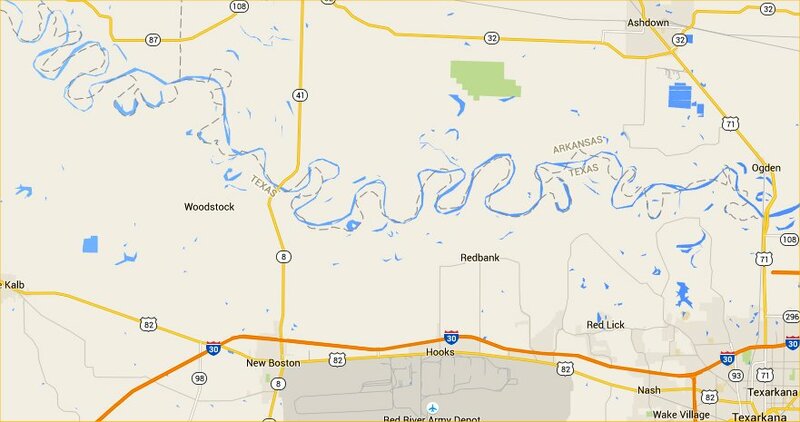 Deviation from old river alignments is best exhibited by the Mississippi River and the Red River in the USA. Examination of the state lines either side of the river will show how the course has changed over the years, but the state borders reflect the course when the original surveys were mapped. 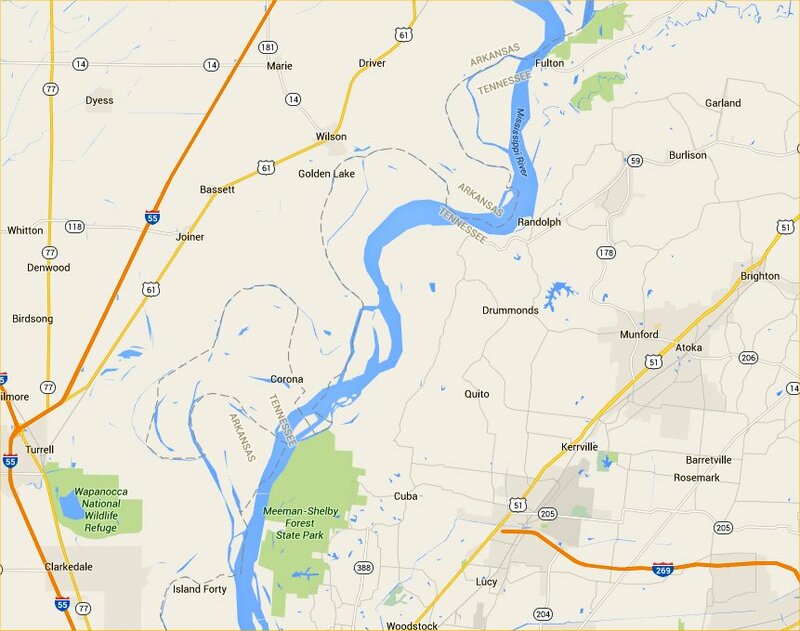 Some US states suffer aggravation from their borders not following the centre of a river - a very ungentlemanly attitude. A few claim state possession up to the far shore of the neighbouring state, effectively claiming the full river width for themselves. This causes legal issues when folk on the far shore erect a pier or jetty from their property, or in some cases when the folk on the far shore try some land reclamation to push the shore line out. Lawyers would then pounce on the far shore folk for rent, land taxes and other miseries. 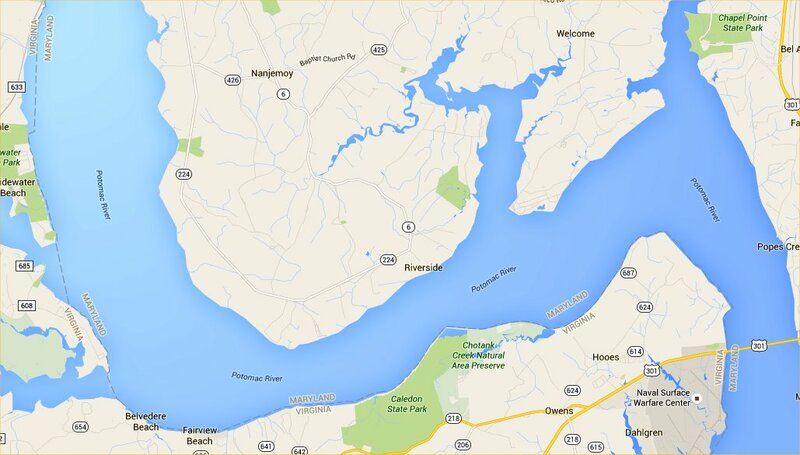 Link to Never Trust a Map - A page of cartographic errors.